Le restaurant l'Orange Bleue a élu domicile au coeur du vieux Lille, à deux pas de la grande place, dans l'une des plus anciennes bâtisses de la ville. Confortablement installés, vous apprécierez tout particulièrement le charme à l'ancienne de l'endroit, son décor chaleureux et son ambiance conviviale. Vous dégusterez une excellente cuisine traditionnelle et en profiterez pour découvrir les spécialités de la région. Enfin c'est la chaleur de l'accueil et la qualité irréprochable du service qui vous séduiront. Fantastic food and nice atmosphere, we will definitely go back. In general a very positive experience for a new years eve menu, only to get the second course we had to wait more than an hour, but that was mostly due to the crowd in the place. Lovely food, lovely interior! Service was a little slow but it was very busy for a Saturday evening during the Christmas markets. Would visit again! Great food. Didn’t like being sat at the table looking into the kitchen. 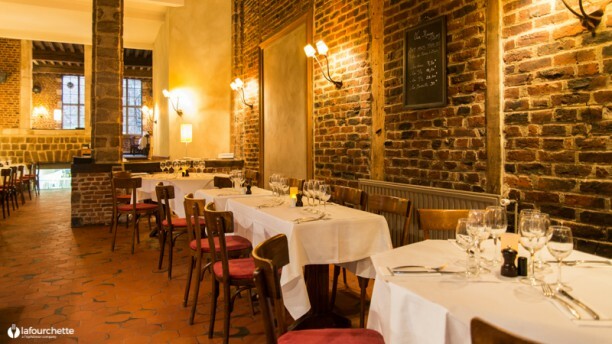 Good restaurant in the heart of Vieux-Lille. The staff are charming and the food is of a good quality. They do a great set-price lunch too. The food was good but the service was rather slow. There seemed to be a problem with the background music, it was quite loud for a minute or so then nothing and the lighting was very bright. Not sure we would visit again as there are so many other restaurants to try in Lille. Nothing exceptional. We tried the Waterzoi for mains which was good. The Magret de Canard was cut like a huge steak and was not to my taste. Good food, pleasant ambiance. When it got busier, we had trouble getting the waiters' attention and had to wait very long for service. With that approved, we would had a 'very good' experience.